We’re sure that you have already used voice search at a certain point in your life. By using the handsfree function in the car to call home or asking what tomorrow’s weather will be like to Siri, the Google Home Assistant or Alexa. Voice search is constantly evolving and it’s becoming a more important way of quickly searching for information. Just as social media was a trend to embrace while mobile devices were getting more popular, so will voice search change our day to day habits. It is gaining more momentum and it will change the way people look for information, services and products in the near future. Why would people switch from typing to voice search? We all know the struggle of autocorrect changing words into random other words, having to take off your gloves when it’s freezing to answer a message, and keeping to type wrong letters because the keyboard is just too small for your fingers. But did you know that in the same time we can type 40 words, we can speak 150 words? Typing has been the only solution for a long time, but it has a lot of flaws and recently people start to get annoyed by that. It is clumsy, unnatural and slow while the world around us keeps getting faster. Voice search is ready to offer a solution introducing a fast, personal and handsfree way of searching and commanding. It is just like asking advice from a friend. It’s easy in the car, when you are busy doing important or fun things around the house, or when you just want to keep on your gloves. 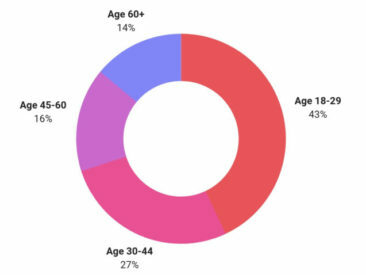 What do we use voice search for mostly? This is just a selection of what you can do with voice search, but the possibilities are endless. To use voice search, you’ll need a Voice Search Assistant. Voice Search Assistants come in many forms. Either use your smartphone, tablet or computer and say ‘OK Google’ (Android) or ‘hello Siri’ (iOS) to it to start searching. Or buy a virtual Home Assistant such as Amazon Echo (also known as Alexa), Cortana (Windows) or Google Home to help you with your daily tasks and questions. What do voice searches look like? Voice search will have a huge impact on our search behaviour and on what we expect from search results. As a website owner, it is very important to understand how voice searches will look like in order to keep up and optimize the content of your website. 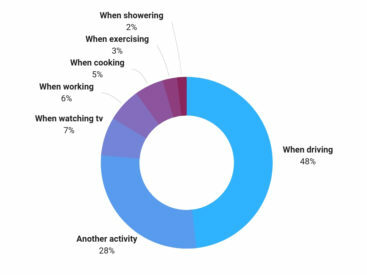 Voice searches are mainly done on a mobile phone. Phones have a small screen, so the searcher will see less search results compared to on a laptop or desktop. This is already an issue for typed searches, but since voice search is mainly done on phones, the issue will become more significant as voice searches will increase over time. When do we use voice search? Besides, the searcher will not always see a search result page. Often, Google or Siri simply read the answer to a voice search query out loud. If the searcher is happy with the answer, he won’t even bother to look at his screen to consult the other search results. The popularity of virtual home assistants is growing at rapid pace, the estimated number of people using smart home assistants such as Amazon Echo or Google Home is projected to reach 1.8 billion by 2021. Because these popular devices are screenless, there isn’t even an option to look at other search results. As the trend of having a virtual assistant is rising, Garnter predicts that by 2020 nearly a third of all searches will happen without a screen. Typed searches offer you a page full of answers, while voice search results choose one answer to read out loud. In other words, the stakes are really high: if you’re number three or four in the search results, you are as good as invisible. Only position one or two count when it comes to voice search. How to streamline your SEO strategy for voice search? If you want to be the first search result on a search result page, your SEO should be optimized for voice. What should you keep in mind? Voice search devices are designed to simulate a natural conversation. When we use our voice to search, we often use long-tail keywords and questions. It is important to understand about how people speak about your business instead of how they search the web for information on your business. Use long-tail keywords & conversational content. Write in-depth blog posts using long-tail keywords and start your heading with a question. Short descriptions. Create clear product descriptions and summarize your valuable services in the FAQ. Question keywords are on the rise. Voice searches are often questions. Use questions and answers to optimize for SEO. Google or Siri often use the featured snippet as best answer to read out loud. Optimize to appear as a featured snippet is in other words the way to go if you want to connect with voice searchers. There are three types, but the paragraph snippet is the most common type. They are mostly 40 to 60 words long. 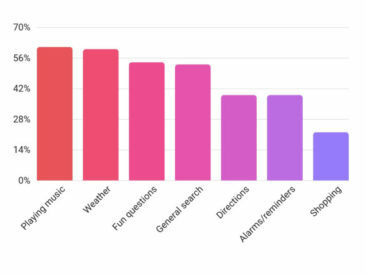 ‘Near me’-searches are the most popular among voice searches. Make it a #1 priority to keep your information on Google My Business, Bing Places for Business and other websites up to date. 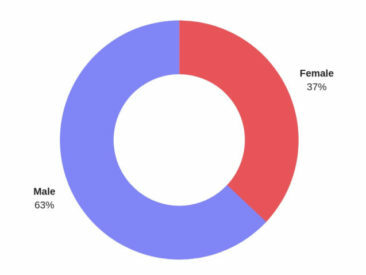 Voice searches are mostly done on mobile phones. Make sure your mobile website is instinctive, fast and good-looking. Although audio advertising is still niche, we expect it to expand rapidly in the next years. Audio ads are already on the rise, we can find them on Spotify, Soundcloud, Pandora, Google Play etc. Another type of voice SEA are custom chatbots integrated in a Google Home or Amazon Echo. The dutch supermarket Albert Heijn created a chatbot to help users find recipes. Simply say ‘talk to Albert Heijn, what can I do with ham and tomatoes?’ to your Google Home to find a delicious recipe. These commandos are called ‘Actions’ at Google. Google Actions have already been used by Disney, Starbucks, Spotify, Ebay, Albert Heijn etc. It is not easy to develop a ‘voice-bot’ and get it through Google’s tests to get it published. But once you have a your own voice-bot integrated in a home assistant, the advantages are endless. Your brand is literally where your users are: in their kitchen, living room, car etc.